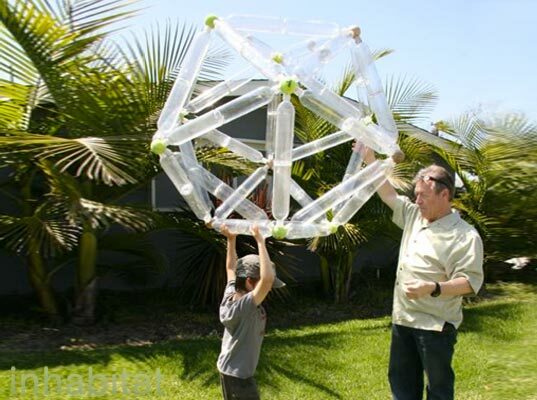 Crafty green-minded architect and grandfather, Ron Aarons AIA, inspired us with a great example of innovative sustainable design for kids: the geodesic dome building blocks shown above are constructed entirely of used plastic bottles otherwise destined for a landfill. Aarons’ Toys from Trash concept teaches kids about recycling/upcycling while laying the conceptual groundwork for children to learn the fundamentals of green design. As if that weren’t awesome enough, Toys For Trash also encourages cutting back on consumerism and using what you already own for entertainment and enrichment! Aarons used the extra downtime he gained when his architectural practice began to suffer in today’s shaky economic climate, to gain awareness in green design principles, and he became LEED certified. Inspired by the notion of creating value from waste materials, he quickly got to work and created something very personal to him that was intended for use by his own grandchildren. Toys from Trash resemble a popular building game for kids: Tinker Toys. Aarons’ toys, however, are made exclusively from used materials. In the case of the geodesic dome, the water bottle bases are glued together to create a system, and bottle caps are connected to a joining structure of wooden balls that screw into the mouths of each bottle. Although many shapes can be created from this system, Aarons made sure that the caps are angled correctly so that most children, even children as young as 6 years-old can accomplish the desired geodesic dome through their own craftsmanship. Aarons’ future design plans for his Toys from Trash creations include marking them with color coding to help guide children into making different geometric shapes, including triangles, squares, wheels, domes, space frames and truss towers. Aarons is also working on similar toy designs made from trash. He is utilizing cardboard tubes salvaged from printer paper rolls and carpet tubes to build real life child-size versions of Lincoln Log log cabins, army forts and other fun geometric shapes. Last week during the Earth Day celebrations — Aarons thought it was a perfect time to introduce the toys to his grandchildren. The prototype proved to be a great success — Aaron’s grandson’s statement says it all, “thinking Green is fun! We need more to make the tower!” Aarons thinks if more families would utilize discarded household items, they could make their own Toys from Trash and could in turn create a dramatic effect on the health of the planet by reducing trash contributions to our landfills. 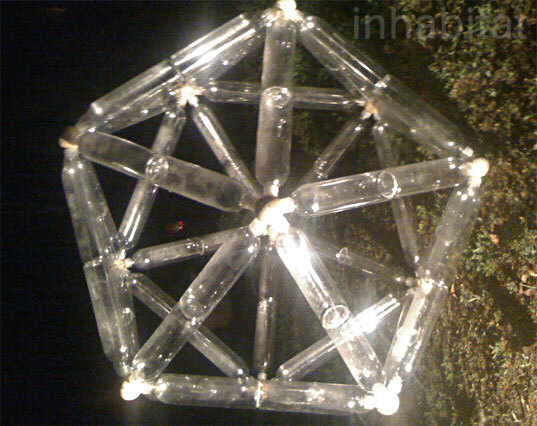 Crafty green-minded architect and grandfather, Ron Aarons AIA, inspired us with a great example of innovative sustainable design for kids: the geodesic dome building blocks shown above are constructed entirely of used plastic bottles otherwise destined for a landfill. Aarons' Toys from Trash concept teaches kids about recycling/upcycling while laying the conceptual groundwork for children to learn the fundamentals of green design. As if that weren't awesome enough, Toys For Trash also encourages cutting back on consumerism and using what you already own for entertainment and enrichment!